After visiting families of victims in Guangzhou and Nanning, we headed to Sichuan. There is only one train every day from Nanning to Chengdu, the capital of Sichuan. The trip, a 32-hour ride, would take us through Guangxi and Guizhou Provinces. Along the way, we saw only high mountains. It was a difficult trip. We left Nanning at noon and arrived in Chengdu at nearly 9:00 the following evening. It was almost 4:00 p.m. on the third day when we arrived at Mr. Xiao Zongyou’s house. Mr. Xiao Zongyou and Mrs. Qiao Xiulan, parents of Xiao Jie. Mr. Xiao’s wife, Qiao Xiulan, greeted us. She didn’t look well. She looked frail as if she had just recovered from a serious illness. It was an apartment with two bedrooms. The place looked dark in the late afternoon light. Mr. Xiao Zongyou is 76 years old. He used to be the deputy director of Chengdu Sedan Car Repair Factory. His wife, 68, was an employee at the factory. Both live on their retirement pension, which is not very much. They live frugally. Though Xiao was a deputy head of the factory, he is an upright man. Several times he passed on his salary increases to other employees. Because of this, his retirement pension is much lower than others at his rank. Mr. Xiao and his wife had two children, a son and a daughter. His son, Xiao Jie, was admitted to the Department of Journalism at Renmin University of China in 1986. He was only 21 years old when he was killed during June Fourth. Their daughter is married with one daughter and lives nearby. During ordinary days, their daughter and son-in-law are very busy at work and have no time to take care of their own daughter. Mr. Xiao and his wife look after their granddaughter. Only on weekends do their daughter and son-in-law come to join them. Two years ago Mr. Xiao’s wife was found to have a tumor in her abdomen and surgery was performed. She is now recuperating. Xiao Jie, with the flag of the Department of Journalism, Renmin University of China. “It is really not easy to be admitted to Renmin University,” I said. “We didn’t have guanxi. He wanted to study journalism and was determined to go to a top-rated university. He got there all by his own hard work,” said Mrs. Qiao Xiulan. 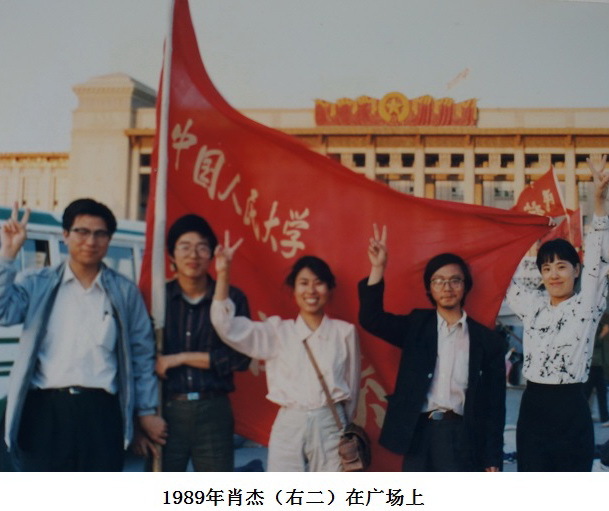 Xiao Jie, (2nd from right) in Tiananmen Square, 1989. Xiao Jie’s mother told us that because of their family’s financial hardship and the high cost of travel during summer and winter breaks, he did not come home sometimes. He would ride his bike to the countryside on the outskirts of Beijing to observe the hardships of the local peasants. One time he traveled to a mountainous area and saw a family that had only one pair of pants to share among all the family members—it was the person going out who got to wear the pants. 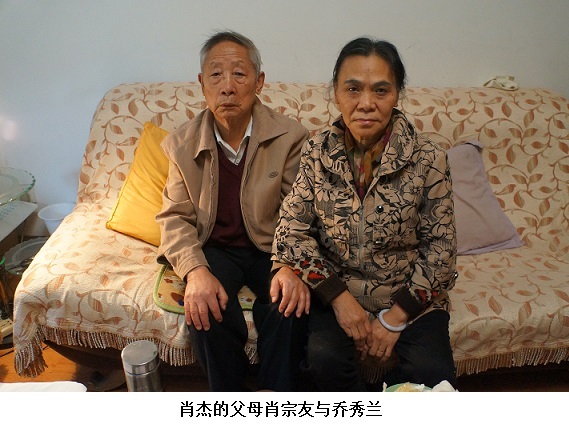 According to her, Xiao Jie said to his father when he came home, “What exactly has the Communist Party done since liberation in 1949 to the present? Decades have passed. If common people can’t even have enough to wear and eat, then what the Communist Party has done is no good. They didn’t bring happiness to the Chinese people.” From this we can see that Xiao Jie was an upright, promising, and thoughtful young man. “He was followed because he was an organizer,” I repeated. According to Xiao Jie’s parents, after the June Fourth massacre, as the situation in Beijing was very tense, Xiao Jie’s teacher was very worried about his safety and asked him to go home immediately. On June 5, someone from China Enterprise News bought him a ticket to return to Chengdu. At noontime, Xiao Jie went to the newspaper’s office to get the ticket. At around 2:10 in the afternoon, he got to Nanchizi Street on Chang’an Avenue. By this time, martial law troops were everywhere on Chang’an Avenue. They blocked all intersections. Xiao Jie passed away at 2:55 p.m. The doctor found his student ID and a train ticket among the things he had on his body. They identified him and notified the school at around 4 p.m.
“Did anyone who was on the scene describe this to you? Or is this only your understanding?” I asked Mr. Xiao. “But based on the accuracy of the shot, it seems the bullet was aimed at him,” I said. “His camera was gone, too,” said Wu Lihong. “Everything was confiscated. Xiao Jie’s classmates said that he had taken lots of photos,” Mr. Xiao said. According to Xiao Zongyou, Xiao Jie’s classmates were very angry at learning this, saying something like: “What kind of world is this! Someone is dead—and we are not allowed to cry or swear, and we are not allowed to hold a memorial service. Xiao Jie should be named a martyr.” To commemorate him—a good classmate who gave his life to the country—his classmates left an empty spot for him in the last row of their graduation photo in 1990. Xiao Zongyou and his wife have kept the school’s findings on Xiao Jie’s death. One of the documents dealt with the circumstances around Xiao Jie’s death. Relatives at Xiao Jie’s grave. Xiao Jie was admitted to our department in the entering class of 1986, majoring in TV and radio broadcasting. At around 9:00 in the morning of June 5, 1989, this student went downtown to get his train ticket. At around 2:10 in the afternoon, he arrived near the cordon at Nanchizi and was, unfortunately, killed by a gunshot. The reason for his death is still being investigated. Based on currently available information, we believe that Xiao Jie was accidentally injured and killed. The authorities will issue the overall findings regarding Comrade Xiao Jie when the situation is stabilized. To his family, from Liu Nieyang and Song Jianwu, Department of Journalism, Renmin University of China. June 13, 1989. Near a phone booth at Nanchizi, soldiers came out of the cypress trees to shoot. The university student (Xiao Jie) ran too slow and was shot in his left chest. It was about 2:10. He was taken to the Public Security Hospital at around 2:55. There were about 100 people who took him in on a flatbed tricycle. When he arrived in the emergency room, he had no blood pressure or pulse. The hospital pronounced him dead. Comrade Wang Min’s testimony is kept at the Public Security Hospital. The hospital also briefed us on the admission of Xiao Jie and verified that he was dead on arrival at the hospital. This happened on June 5, 1989. Ni Ning, Department of Journalism, Renmin University of China. June 12, 1989. Xiao Zongyou and his wife brought their son’s ashes home and set up a shrine for him. At that time, the June Fourth incident was labeled a “counterrevolutionary riot.” Leaders and coworkers at Xiao Zongyou’s work unit all felt very sorry about Xiao Jie’s death. Many of the coworkers and neighbors who saw Xiao Jie grow up all praised him as a sensible child with a sense of justice, never believing that he would ever do anything to harm the country. Many coworkers, relatives, and friends came to the Xiaos’ home to mourn the death of Xiao Jie. “Where are Xiao Jie’s ashes buried now?” I asked. 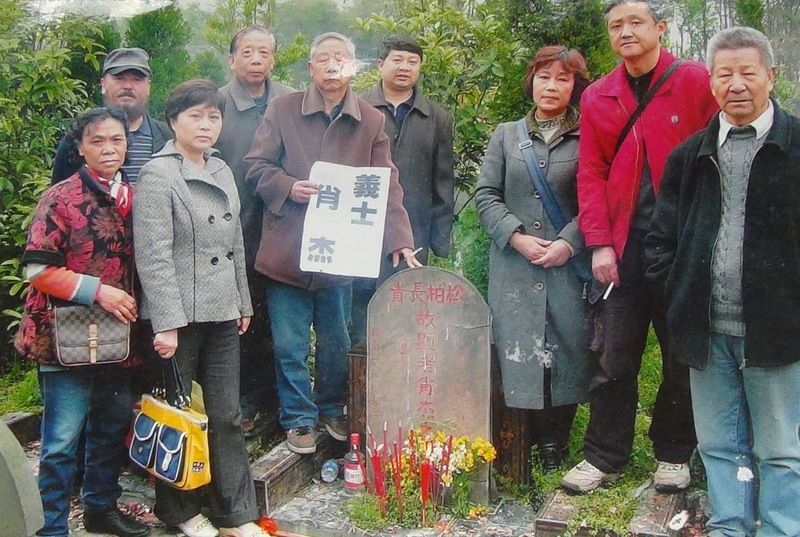 In Chengdu, many students from that time, along with those who sympathize with the 1989 movement, accompany Xiao Zongyou and his wife to sweep Xiao Jie’s grave on the Clear Brightness Festival every year to commemorate his soul. 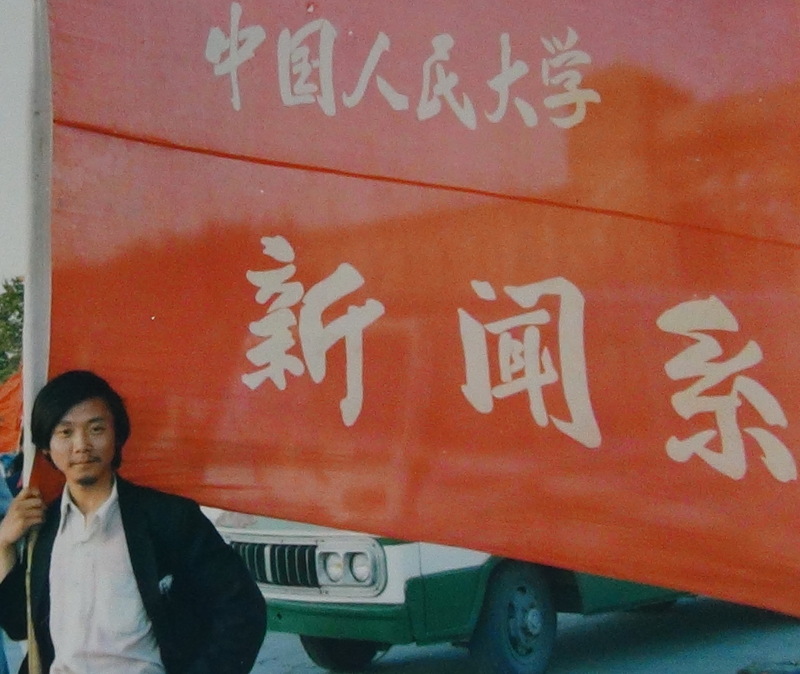 When sorting out stuff left behind by their son, Xiao Zongyou and his wife found his last will and testament, which he wrote to his parents while occupying Tiananmen Square. Below are excerpts from the will. Your unfilial son will be leaving you. Your son knows that you have expended great efforts and suffered enormous hardships to raise me from an infant to a man. This isn’t something that can possibly be covered by a few ten thousand yuan. I will never be able to do enough to repay your kindness of bringing me up. Even so, with great regret, I cannot help but suppress the sorrow and leave my loved ones. In the normal course of events, after the years of hard work that you both put in, even though our family is not considered on the top of the heap, we are basically doing well. After I graduate from college, I should also have a certain social status and a good future. I should have been satisfied with that. But when I look around at this poor and backward country, this dark and filthy and unfair society, and when I think of my goals, it is in fact hard for me to feel at peace and content. The country has taken a wrong path and has sunk into a quagmire of poverty and backwardness. With privilege in their hands, rulers live decadent, corrupt, and debauched lives. Children of high-ranking officials use their power to act like tyrants and do evil things. In this society, thugs lord over the people and run amuck. Police wallow in filth with the real dregs of society, who pay them off with cigarettes and liquor, and they behave as viciously as wolves and tigers with the common people, beating and kicking them. Hundreds of millions of honest peasants are still mired in ignorance. Common people are timid and obedient. The darkness and unfairness of the society, the filthiness of the rulers, and the numbness and indifference of the people—all these make it hard for me to attend only to myself, look after only my own little family, and serve you in contentment. When the people are not well, how can I dare to forget about their concerns? When I haven’t reached my goal, how can I dare be concerned with just myself? Perhaps it’s a pity that my heart has not become numb completely. This wakefulness results in my spiritual suffering. I cannot (note: six characters are illegible in the original document) look at these things and pretend I don’t see them and remain indifferent and numb! My sense of social responsibility does not allow me to remain silent; my sense of historic mission does not allow me to be timid; my unrealized ambition does not allow me to wallow in the mire! I want to climb to the top and yell out loud. I want to wake up those folks from their deep sleep. I want to shake their numb souls! Wake up, my China! My hot blood is boiling inside me and surging forward. I can see myself filled with unstoppable fervor and aspirations. I can absolutely not just watch, while my country walks further down its wrong path and sinks even deeper into the dark injustice. I want to rise up and fight against it. I want to reform this sick society afflicted with all ills! Though my strength is limited and too lacking in force, I must fulfill my responsibility with whatever little power that I have. Insignificant as it may be, it is nonetheless a burst of righteousness. I know that there cannot be a good ending for someone who opposes the representative of the mighty conservative forces—the ruling Communist Party. When it comes to the cruel methods they use to crackdown on dissidents against their dictatorship, no bourgeois democratic government, especially not the authoritarian Nationalist government that was driven to that small island, can match them. Be that as it may, I will absolutely not surrender to reality! They can brand me now as a “counterrevolutionary element,” but history shows no mercy. With the passage of time, history will make a fair judgment, and will tell the world who was the reactionary conservative force that blocked the historical process and who were the revolutionaries who truly considered the future of the nation. For the Communist Party in its early days, provoking students to oppose the one-party rule of the Nationalist Party and engaging in an arduous revolution was considered progress. But when people shouted “oppose the one-party rule of the Communist government,” it is viewed as reactionary speech and behavior! When you compare the two, you can see how blatantly hypocritical and selfish this regime is! Why are only you allowed to oppose one-party rule and no one else is allowed to oppose your one-party rule? How come only your party is allowed to exist, and no dissident force is allowed to exercise supervision over you? What can this mean except that it exposes the selfishness and bully-nature of this political party? How merciless the ridicule of history will be! I believe that in several decades, when people look back at those of us who are considered by the current society as “counterrevolutionary elements”—and even if the regime which selfishly puts itself ahead of the interests of the state and the people is still in power, and if we are still viewed as “counterrevolutionary elements”—the day will come when history will recognize our value fairly. History will prove that we did not let down this nation and this country. We, with our flesh and blood, are the vanguard and cornerstone of China’s democratization and modernization! I have nothing in this world that I cannot bear to part with—except both of you who gave me life and raised me. (Except for you both, there is no one in this world who is truly emotionally attached to me and cares about me). Not being able to show my filial piety and to repay your kindness for bringing me up and nurturing me is my greatest and last regret in life. How I wish I could repay you! But since antiquity, it has not been possible for someone to be both loyal and filial. I must be loyal to my ideals and my convictions and loyal to this poor and backward nation and people. In order to not give you even more pain because of my act of rebellion, I must shed my tears and bear the suffering! Please swear at me, this selfish son, who has the heart to leave his biological parents behind for the sake of his ideals and convictions! Let your son call you for the final time, Father and Mother. Fang Lizhi was an astrophysicist and the vice-president of the University of Science and Technology in Hefei, Anhui Province. His liberal political views inspired the student movement of 1986-87. He was expelled from the Communist Party of China in January 1987. This is a reference to Taiwan. Xiao Jie (肖杰)(birth name: Xiao Fengjie, (肖峰杰)), 21, male, a third-year journalism major at Renmin University of China. On June 5, 1989, he had already purchased a train ticket to go home to Chengdu, Sichuan Province. At 2:10 p.m., when he was walking along the southern end of Nanchizi, a street adjacent to Tiananmen Square, he was shot by martial law troops. A bullet hit his back and exited through his chest. He was put on a flatbed tricycle and carried by residents to the emergency room of the Public Security Hospital. He was pronounced dead at 2:55 p.m.